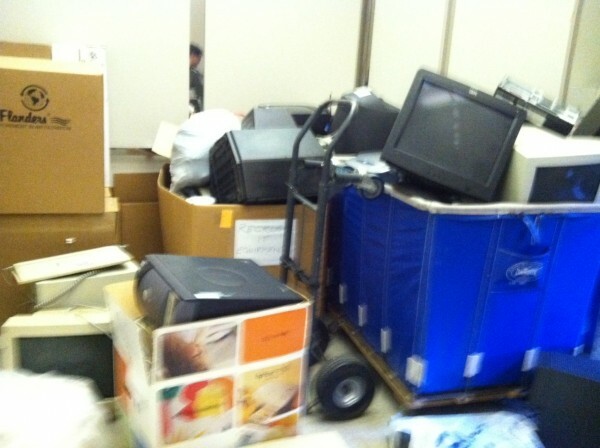 How exactly do you safely dispose of 14 PCs, 11 CRT monitors, 10 laptops, 3 UPS units with dry batteries, 4 TVs, 4 printers, 2 scanners, and a 4′ tall crate of miscellaneous electronics? With a museum-wide electronics recycling drive! We hosted our first-ever electronics recycling service for museum employees last month. All were invited to bring in their obsolete gear for recycling. We hope to offer more drop-off opportunities in the future and appreciate our colleagues for helping to make the planet a little more green. We used Turtle Wings, a woman-owned, government-approved company based in Maryland, to provide the electronics disposal services. An added plus–they operate on a strict no-landfill policy with strict export controls. This entry was posted in Experiment Station and tagged electronics, IT, recycling. Bookmark the permalink.